William H. Powers, son of William T., and Joseph H. Walker were the men behind the casket company, founded in 1873 and located on Front Street. 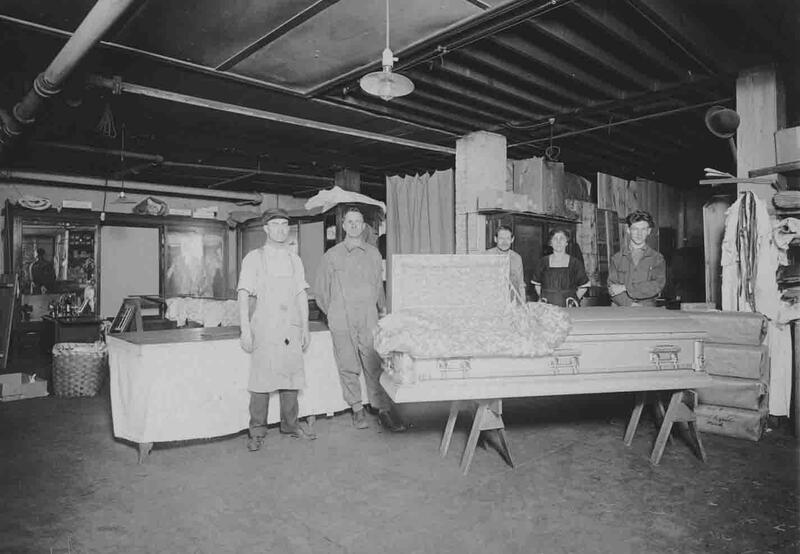 The four men standing behind the padded and silk-lined casket, supported on sawhorses, appear to be employees of the company. It is unknown if the woman is an employee or possibly Sarah Powers, wife of William H., who took charge of running the company in 1895 after his death, and continued to do so until 1928 when Powers & Walker closed. An electric light hanging from the ceiling limits the unknown date of the photo to a certain degree. Coll. 54-41-18, History & Special Collections Dept.